MARRIAGE OF MR JON BULLOUGH AND MISS LILY ELSIE. 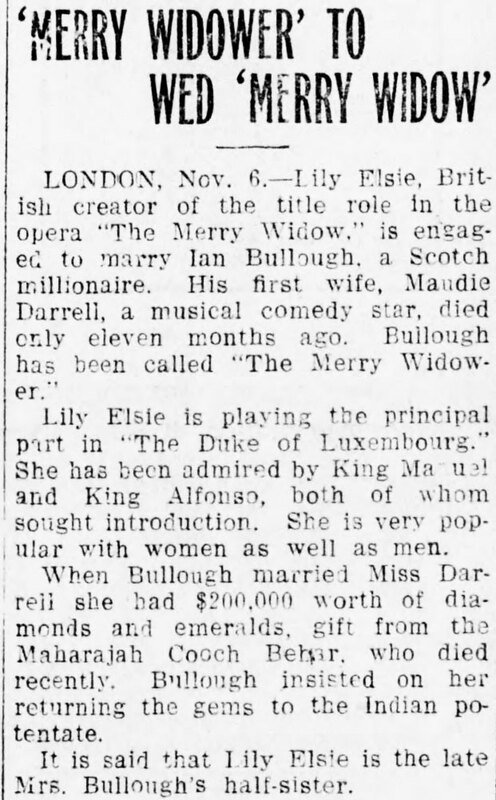 Mr. Ion Bullough and Miss lily Elsie, the one the son of the late Mr. John Bullough, head of the great Accrington Firm bearing his name, and the other a famous London musical comedy actress, are to be married in London on November 25th., though where the ceremony will take place has not yet been decided, further then that it is to be one of the west End churches. Concerning the bride's intentions after her marriage there appears to be some slight uncertainty. When Mr. Bullough was interviewed in London on Friday he said that no decision had yet been come to as to whether Miss Elsie should retire from the Stage. "The matter is now one for negotiation between Mr. George Edwardes and myself" he said, "but I think it quite possible that Miss Elsie will retire". Mr. Bullough and his bride will spend their honeymoon on the continent.